Happy days. In UK at least Summer was, until recently, showing very encouraging signs of actually being a real season. But every silver lining has its cloud. 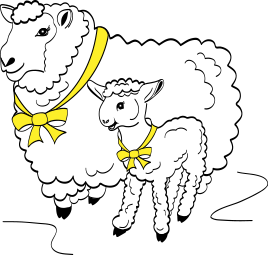 With this rise in temperature comes Mrs Mutton’s Style Conundrum Number 2: when, where, whether, if, how… do you get your legs out? Many people I know have no problem with this, following the simple equation: weather gets warmer = remove hot layers from legs. Not me. Like someone teetering on the edge of a diving board, it takes an almighty shove to part me from my beloved black Wolford opaques. As each year goes by, my 50 odd year old legs look more and more like a prop from Alien: grey, knobbly and ever so slightly crusty. They do not enhance any outfit from the bottom of which they poke out. Of course like all of us I don’t give much of a toss if I’m on my holly bobs or with my family and friends. But for work, weddings and wild wingdings, I’m more reticent about displaying my bruises. veins, scars and crepey bits. So what to do? If we all behaved as women’s magazines suggest, then we’d start our “Summer legs beauty” regime on, say, Boxing Day – which, what with the dry brushing, the exfoliation, the caffeine rubs, the lymphatic massages, the lunges, the squats, the elongating Barre workouts, the collagen supplements, the subtle golden glow from a celebrity spray tanner, the endless frigging avocados, would be pretty much all we’d be doing from then on. Guess what. I don’t. And so dear reader, as ever I’m in the market for quick fixes. 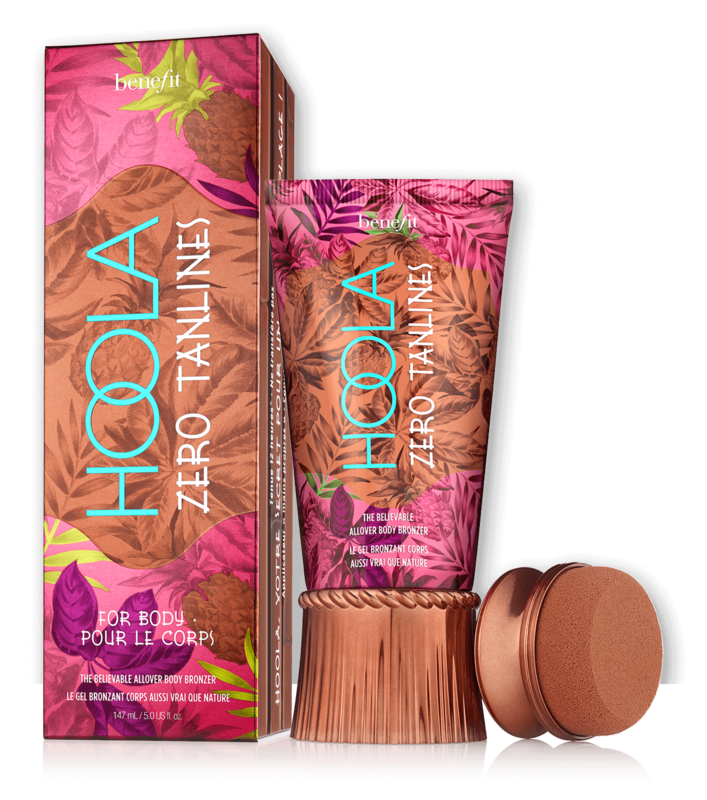 I’ve spoken about this one before, but the San Tropez gradual tanner you use in the shower is my favourite way to get some colour onto those lower limbs. At least this way all of me is roughly the same colour. Like all self tanners it can do strange things around the knees and ankles, but because it is a gradual tan it does it very very subtly. This Works “Perfect Legs Skin Miracle” is something of a cult product on the beauty pages. I have it in my cosmetics drawer, aka the vault of Hope. I find it too dark for my glow in the dark legs. I also find the texture a little heavy to blend well. However, their Dry Oil is very good. If only they could somehow combine the two. My friend S introduced me to this. I often think Benefit is a victim of their own zaniness – it’s hard to take their products all that seriously (and I feel the need more and more for SERIOUS beauty products). This gives your legs a glow that just takes off that mortician glare. My friend K who is has that enviable black hair, blue eyed, pale skinned Scottish colouring, uses this Superdrug own label wash on/wash off mousse and last year I joined her. It really is rather good and lasts most of the day. But like all of these browning products, don’t forget to apply them to the other bits that show so your limbs match. 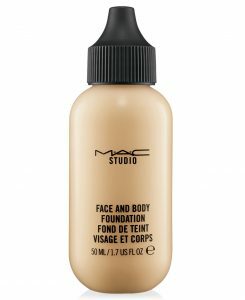 Finally, the Mac Face and Body makeup will disguise your blemishes and bruises if you’re not interested in a tanned look. TV and film types use it for red carpet events to get their pins looking smooth and lovely. The easiest strategy, and my default option especially for work, essentially this involves showing a little bit of leg, or adopting other summery cues. I love short skirts and encourage any woman to wear them. But for most of us that’s easier in Winter when we have tights and boots on our side. So instead, I favour trousers in Summer. This year Uniqlo has come up trumps again. for Summer basics that don’t reveal too much. The range of 7/8 ankle length trousers give you a Summery feel without actually having to get your legs out. 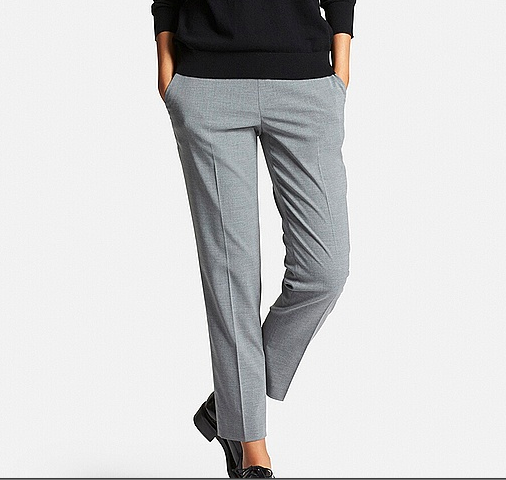 These are well cut and look smart, even though they have an elasticated waist. This year I have veered into the world of the wide legged trouser. 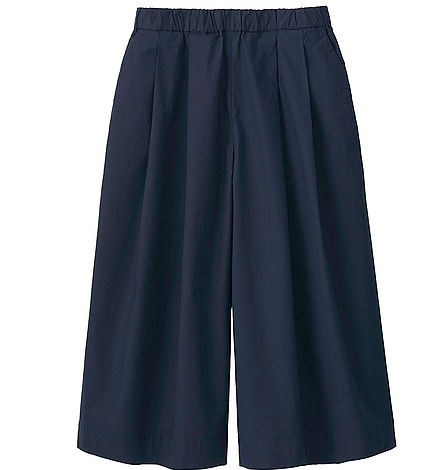 I particularly like the Uniqlo “gaucho” pants in cotton which are currently a bargain £14.90. I think they’ve got an edgy look which works with heels, flatforms or trainers and because they end around mid calf, there’s not that much leg on show to worry about. Maxi skirts and dresses don’t work for me in the office – too beachy – but they are excellent for all other occasions. This is a little gem fro my Uniqlo love in. Overall, the Liberty collection from Uniqlo is a little OTT for my tastes but this long tank dress with a built in bra in various prints is an easy to pack gem for £24.90. This is very informative for those of us so much older then we’re younger than that now! 2 extra products that are really good too are Sally Hansen’s Airbrush legs in 3 shades. Disposable gloves a must but your pins look good afterwards and excellent if wearing sheer tights despite reading recently some irritating little Madam declaring only bare legs will do this summer. The other product is Clarins Delicious Self Tanning Cream which comes all made up in a rather fetching caramel colour which you just apply (again with gloves) and leave briefly to dry. The only drag being that you should shower it off before bedtime, particularly if you have white sheets, as sweating hard will leave you with a hefty bill as you are forced to buy new sheets…. Pip Pip and looking forward to your next missive.